Dashboards provide intelligent management with (deleted ‘a’) 1 page real-time updates on critical elements of company-wide data in an easy-to-read graphical format with drill down capability. Dashboards provide absolute visibility of the entire company by allowing you to access key business measures & critical information on sales, purchasing, receipts, order status, and financial activity. This business intelligence software allows you to manage each area of your company and increase the speed and accuracy of business critical decisions. Monitor business performance & KPI’s. Access high-level sales, order and financial information. Graphical high level formatting with 1-click access through to source data & sub reports. Access detailed reporting through 1-click access. Compare data between different date periods. 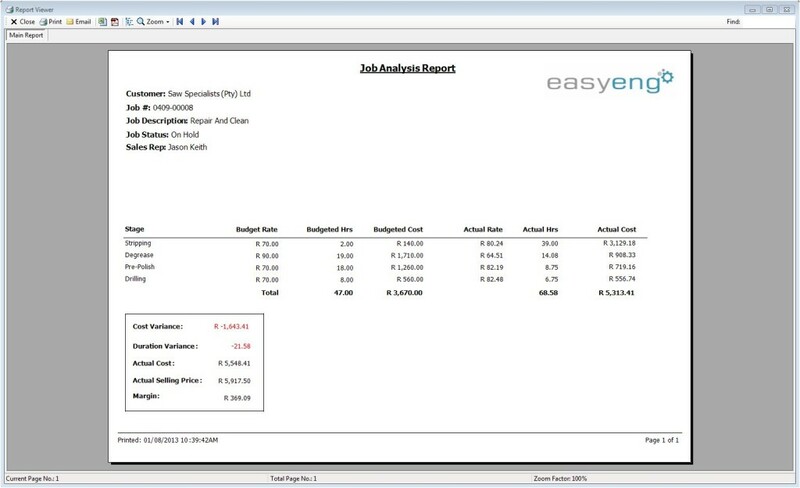 EasyEng provides standard out-of-the-box reports that are designed around best practises in the industry. Custom reports can be also be quickly developed by our fulltime development team in order to meet your custom requirements. EasyEng is the key to your engineering business solutions.